Real­ly, I’m a bit at a loss for words. It may not be the most worth­less prod­uct, but at $10 + ship­ping it’s going to have a pret­ty low worth to cost ratio. Maybe it would be use­ful if you had a real­ly small dog? This entry was posted in ThinkGeek and tagged cell, cell phone, life, products, think geek. Bookmark the permalink. Actu­al­ly I can see that it would be an exceed­ing­ly handy piece. By its very nature, it’s infi­nite­ly adjustable for angle and loca­tion, so if you want your phone to sit on a desk while you do some­thing — hands­free per­haps — you can set it so the screen is exact­ly point­ed to your eyes, and it’s easy to change that slight­ly as you move. So, view­ing pho­tos or oth­er con­tent, while speak­ing on the phone, while doing some­thing else on your oth­er com­put­er — all of this is no prob­lem to the tech­no­log­i­cal gen­er­a­tion, thanks to a piece of fur­ni­ture which comes from the pre­vi­ous gen­er­a­tion. Or is it more the pre­vi­ous gen­er­a­tion being tick­led by the fact that some­thing they invent­ed is still rel­e­vant? 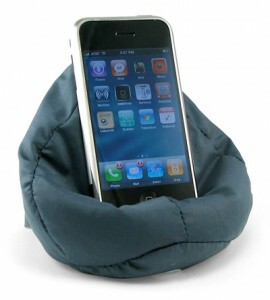 Anoth­er ben­e­fit I realised just after I post­ed that reply was that if you place your phone on the bean-bag chair, it will be very well shield­ed from unwant­ed extra­ne­ous nois­es from your desk envi­ron­ment as you con­verse on it. For exam­ple, key-thump­ing from your desk­top com­put­er, or rum­bles from the proces­sor fan, etc, will not be trans­mit­ted into the con­ver­sa­tion.